Please note: This film does not come with Public Performance Rights. If you wish to do a screening outside of a face-to-face classroom setting, please contact us. The math is simple. To avoid climate catastrophe, we have to limit carbon dioxide emissions into the atmosphere to 350 parts per million or below. The only problem? We're presently at 400 parts per million -- and climbing. In November 2012, bestselling author and environmental activist Bill McKibben and 350.org, the organization he founded, hit the road to raise awareness of this terrifying math and build a movement to challenge the fossil fuel industry. Do the Math takes us inside that tour, following McKibben as he delivers an astonishingly clear breakdown of the facts -- and the stakes -- to more than 25,000 people at sold-out shows in 21 cities across the country. The film serves as a much needed correction to industry spin, and shows how an unprecedented global movement is rising up to keep CO2 emissions down. Highly recommended for courses that look at climate science, geography, environmental policy, corporate influence, the costs of mass consumerism and consumption, and social change movements. "Do the Math is a wake-up call on climate change and fossil fuel use. It presents a clear and convincing case that we need to wake up and take action. Don't miss this film." "Do the Math is essential viewing for anyone interested in the points of contact between climate change, politics, and the global economy. It brings home a compelling message from Bill McKibben that the world must reform an economic system tilted heavily towards using several times as much carbon-based fuel as the atmosphere can sustain. Watching this film, supplemented by considering how consumer choice drives this economic imbalance, is a useful starting part for becoming a thoughtful 'global climate citizen.'" "Watch the film, do the math, sign up for the struggle, and link it to the struggles you are already involved in. Our common future depends on it." 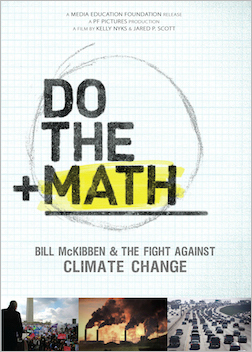 "Think of Do the Math as a sort of grassroots sequel to An Inconvenient Truth." "Do the Math is an inspiring, humble and hopeful movie with a focus on how all of us can be part of the climate change solution." "Makes a compelling case about how it is time to stop playing defense for the environment; we had better start playing hard offense."